1. Put chickpeas in a large bowl with plenty of water(there should be at least 6 inches of cold water above the chickpeas). Let them soak overnight. They will double in size as they soak – you will have between 4 to 5 cups of chickpeas after soaking. 2. Discard excess water. Transfer soaked chickpeas in a food processor along with garlic, ground coriander, ground cumin & salt. 3. Blend until the mixture is of grainy texture (not smooth). Check and discard any large chunks of chickpeas. Add all other ingredients & mix well. 4. Transfer into a storage container and refrigerate for at least a few hours for the flavors to mingle. 5. Next heat oil on medium heat for deep frying. Once hot reduce heat to low-medium flame. 6. With wet hands, take about 2 tablespoons of the mixture and form an oval shaped ball. Drop one ball in hot oil first. At this point if the mixture falls apart, sprinkle with some more flour, a tablespoon at a time. Continue frying. 7. Deep fry falafels on low-medium heat until brown all over. This should take about 6-8 minutes. 8. 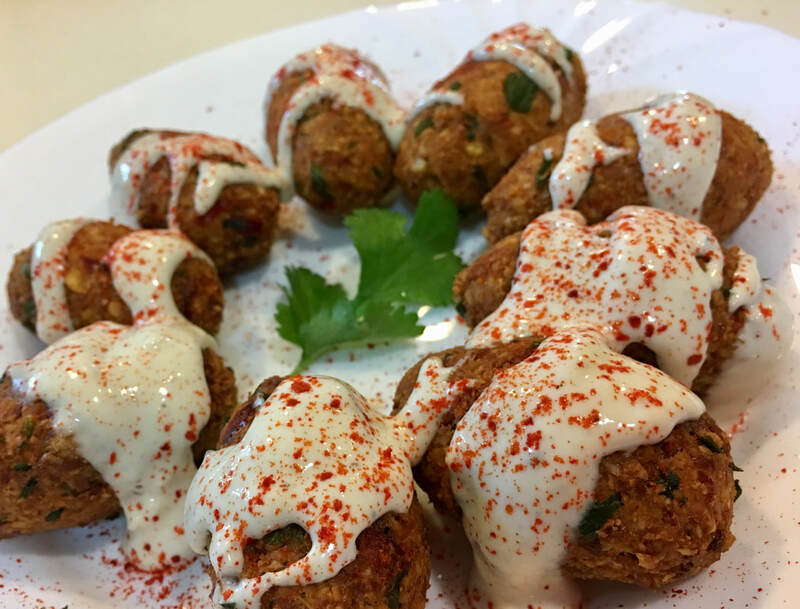 Serve hot felafel with hummus, or tahini dip. Recipe for tahini and yogurt dip can be found here.